The Breezer Downtown is a great bike for those who want to commute daily, particularly in a city setting. This bike has a chromoly steel frame and a steel fork. The Downtown weighs a little over 14 kilos. This is a cheaply priced bike. The Breezer Downtown is a bike that sounds and looks like it belongs on the city streets. Its bright, sprightly appearance had us very intrigued to see what this bike had to offer. The Downtown definitely does not belong in the lightweight department. At its weight, it can be considered a tad bit heavy, particularly if you are on the smaller side. Still, we did not find this to be too much of a challenge when we first hopped on. As it is a commute bike, we really appreciated the upright position on the Downtown. This allows you to get into a more comfortable position as you cycle along. If you have an especially long commute, this is something that you are really going to welcome. This is not the only thing that is comfortable on the Downtown, however. The saddle and the tires allow all rides on this bike to feel incredibly soft and smooth. As you can imagine, the Downtown is at home on flat streets. However, there were enough of speeds for us to be mildly intrigued with just how much climbing we could get away with. We found out that as long as you do not get too ambitious with the inclines, the Downtown will respond well. We also liked that there were rack and fender attachments. This really does make a lot of sense if you are not planning on riding around empty handed. This makes the general design quite well thought out. Obviously, we would have really appreciated an aluminum frame. At this price point, however, and considering the overall performance, we can’t really complain too much. Overall, the Breezer Downturn really is a good value for money. 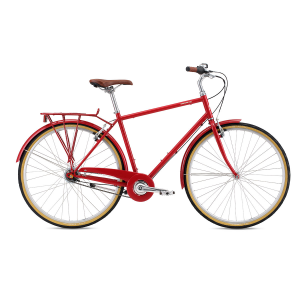 The Breezer Downtown is a budget friendly, comfortable commute bike that works well in a city setting. If you are looking for a bike to ride each day, you will be remiss if you did not give the Breezer Downtown a good once over at least.